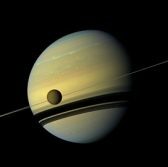 A team of Northrop Grumman and Global Aerospace Corp. has received a contract from NASA to build a space vehicle that will work to explore Saturn’s Titan moon. GAC and Northrop’s aerospace systems business will collaborate on the development of the concept and prototype of the Titan Winged Aerobot vehicle through the space agency’s Phase I Small Business Innovation Research initiative, GAC said Wednesday. TWA is a hybrid entry glider based on the Northrop-built Titan Lifting-Entry Atmospheric Flight platform. The TWA vehicle has a three-dimensional directional control system and runs on one radioisotope power source. GAC said NASA could potentially use TWA in habitability studies, astrobiology and prebiotic exploration missions and other scientific experiments that include the exploration of Titan’s crust through subsurface radar sounding measurements and determination of the moon’s surface geomorphology through infrared imaging.